Lessons focus on learning the student's desired songs in a variety of strumming and finger style techniques as it applies to the lesson; chord progressions, beginner and advance; focusing on improving areas of difficulty; detailed explanations of the "whys and hows" of music, and most importantly, having fun, an essential element to learning ukulele! Audrey has been studying ukulele, voice and music theory since 2012 and began teaching in 2017. While Jazz is her first love, she is well versed in everything from early folk and rock tunes to current hits by today's most popular artists. Audrey Robinson has been playing the ukulele since 2011. She began her instruction at a young age under the tutelage of the late, great ukulele teacher Stu Herreid. 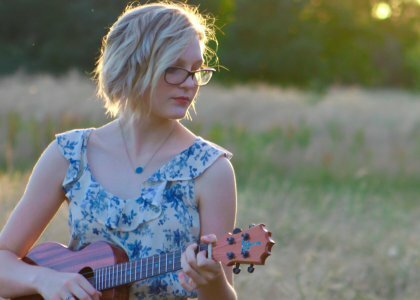 She currently studies ukulele and voice with performer, Dani Joy. Through Dani's mentorship, Audrey discovered and fell in love with early jazz. Audrey performs regularly throughout the community. In June of 2018, Audrey was invited to tour England and Wales as a member of the Northern California Children's Chorus, a community choir based in Sacramento California. Audrey began teaching her own students ukulele and singing in 2017; in the same way that she had been taught by her mentors Stu and Dani Joy.